Product categories of POE Switch 8 Ports, we are specialized manufacturers from China, POE Switch 8 Ports, 8-Port POE Ethernet Switch suppliers/factory, wholesale high-quality products of POE Switch 8 Port R & D and manufacturing, we have the perfect after-sales service and technical support. Look forward to your cooperation! 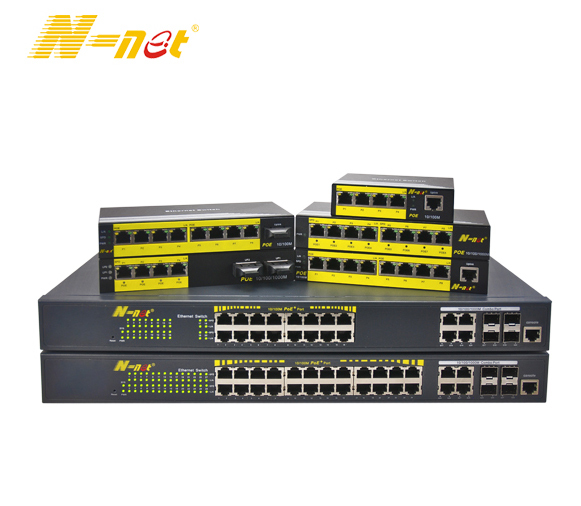 N-net 8 ports POE Switch series support 8 port 10/100M or gigabit PoE ports and various uplink choices like RJ45 port, fiber ports and so on. Unmanaged and managed are optional. It also support IEEE802.3 af/at standard, up to 30W PoE output per port, with total power budget 130W or 250W (Built-in power supply).